Off the beaten track, Ha Giang is a rugged and beautiful mountainous region that stretches north towards the border with China. 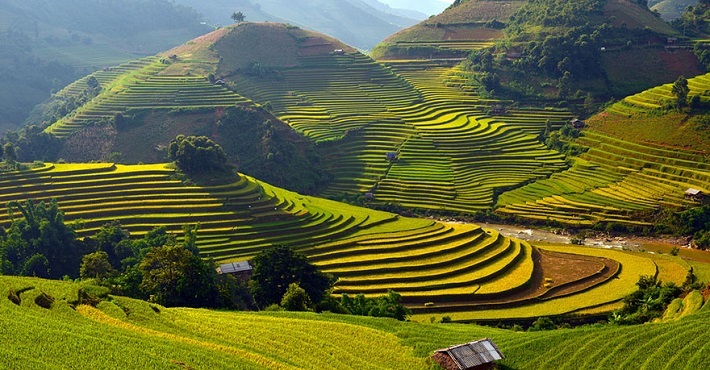 Zigzag over mountain passes to discover some of the most beautiful vistas and walking country in Vietnam and beyond. As a developing region luxury hotels do not exist and most visitors look forward to experiencing a selection of home stays. A world away from our manicured world, don’t forget your camera. 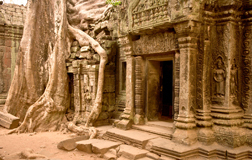 Combine an overland tour here with the more established favourites and you’ll get a real sense of what makes Vietnam so special. 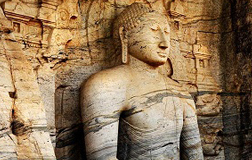 Below is just an example itinerary, other destinations can be added. 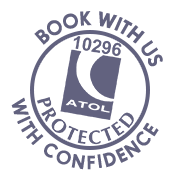 On arrival you’ll be met by your private guide and transferred to the city centre where you check in to your choice of hotel for 2 nights. This morning you’ll be collected for a small group (max 8 people, but can be upgraded to private) city tour. The day kicks off at Ho Chi Minh’s mausoleum where you join thousands of Vietnamese as they pay their respects filing past in solemn silence. The complex is also home to his stilt-house, Presidential Palace and One Pillar Pagoda. From here walk a short distance to the Temple of Literature, Hanoi’s first university. 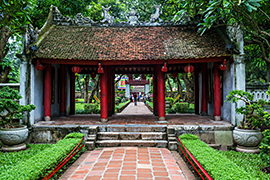 Originally built as a temple dedicated to Confucius, it became Vietnam’s first university, dating back to 1070.After this, break for lunch in a lovely local restaurant. The rest of the afternooon is free and then this evening meet your guide for an introduction to Hanoi street food. They will introduce the tour (small group - max 8 people) before heading to ‘bia hoi corner’ where you can try the local brew while watching the busy streets of Hanoi’s Old Quarter. Bia Hoi is a draft beer that is brewed daily and usually drunk by locals sat on small plastic stools whilst enjoying Hanoi's version of tapas. 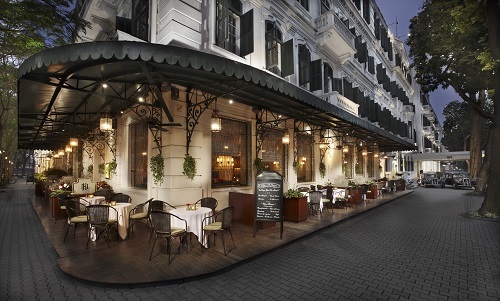 Continue through the bustling old quarter and listen as your guide tells you about the various foods on offer. Stop and try some samples before you head for a Vietnamese style barbeque dinner. Here your guide will select an array meats, tofu and vegetables on skewers while you sit down as they flame grill the food for you. Walk a little more along the streets and then to Hoan Kiem lake for dessert. Your final stop is at Hanoi’s most famous ice-cream street. An unforgettable experience shared with scores of young Hanoians. This morning you’ll be transferred by minibus to Halong Bay (3.5/4 hours). Meet the crew and board the traditional wooden junk for 1 night, then relax and enjoy lunch while the boat heads toward the secluded islands. Visit ancient limestone caves and go sea kayaking and swimming (weather permitting). Return to the junk refreshed & invigorated to relax on deck with a drink watching the sunset and enjoy a seafood dinner looking out over the bay. Enjoy breakfast as you continue to cruise through Halong and visit the floating fishing village of Vong Vieng to learn more about daily life living on the bay. Cruise back to the dock whilst enjoying a light lunch, then return to Hanoi for a further night. This morning your private guide will collect you for a 3 night tour of Ha Giang, a rugged and beautiful mountainous region that stretches north towards the border with China. 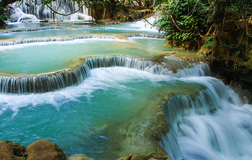 Zigzag over mountain passes to discover some of the most beautiful vistas and walking country in Vietnam and beyond. As a developing region luxury hotels do not exist and most visitors look forward to experiencing a selection of home stays in hill tribe villages. On the first day there's a lot of driving involved but you will be rewarded with stunning mountain scenery and few other tourists. There will be time to stop en route to take photos. Leaving Hanoi behind, you soon start to get a good sense of rural Vietnam as the scenic route cuts through dense jungle and crosses valleys and rice fields as you start to rise up into the mountains. Along the way you may encounter the Nung, Tay, Dzao, La Chi and Pa Then, just some of the many hill tribe groups who have settled here. 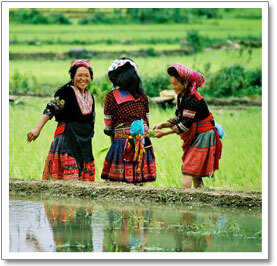 Arrive Tấn Xà Phìn village mid-afternoon and enjoy a 2.5 hour walk down to the valley where the Tay live. Overnight at a homestay with family of Tay ethnic group. Village life starts early and this morning you'll have the chance to watch mountain life begin a new day before joining your guide for a full day (5 hours walking) exploring the hills, stunning rice terraces, beautiful countryside and hill tribe villages. 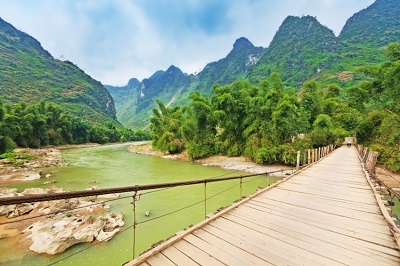 Head to the small town of Nam Son and start the walk by crossing a suspension bridge that leads out into the hills. The day will be spent with your guide following tracks from village to village (Long Tunics Dao, H’mong Flower and Nung), with time to watch everyday life ebb and flow and admire the stunning views of the terraces, hills and open countryside. Enjoy lunch with a family of H’mong Flower. This evening homestay with the Nung or Man Ta Pan ethnic group. This morning's drive along winding mountain roads sets the scene for the day, as each turn reveals a land covered in thick forests broken up by many small tea farms and the iconic, staircase-like rice terraces. 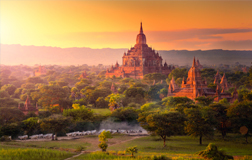 Today's hike (5 to 6 hours) will take you through this stunning scenery and along the way you'll see local farmers tending rice paddies, farming on terraced hillsides and working in the orchards. 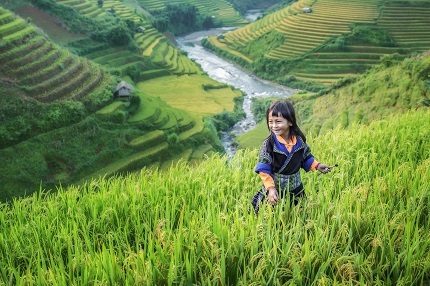 Stop at Suoi Thau village inhabited by the Long Tunics Dao and close to the region's largest terraced rice field. The area is famous for growing the distinctive Shan tea with its white haired buds that's drunk throughout Vietnam. Here walk through a 100 year old plantation and learn more about its production and history. From here visit an ancient temple of Long Tunics Dao people and then enjoy lunch with a family of Man Ta Pan ethnic group. This afternoon the walk continues for a couple of hours and then overnight at a homestay with a Long Tunics Dao family. This morning your guide will take you on a final walk through the paddy field scenery before the long drive (7 hours) back to Hanoi. Stops and lunch will be included along the way. 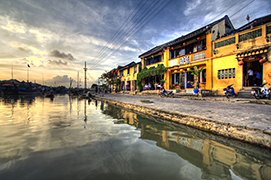 From Hanoi, Hoi An is a short flight south. 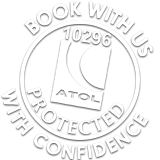 On arrival met and transferred to your choice of hotel for 3 nights. Extra....Hoi An is also blessed with superb beaches and so you can choose to stay on the beach and in the town, depending on where you'd like to spend most of your time If you’re here from March to September the weather should be perfect to enjoy the beach, why not extend for a few days? 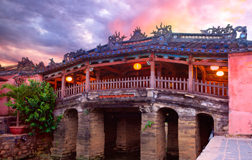 Hoi An is invariably a favourite with those travelling through Vietnam as it's easy to explore the Old Town under your own steam or perhaps head down to the beach. There are also a host of excursions we can offer, for example a cycling tour of the surrounding countryside or perhaps an informal cooking course in a beautiful setting. 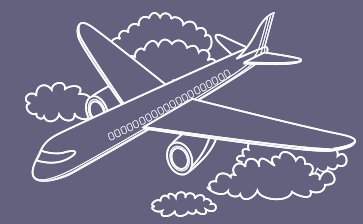 Private airport transfer and flight south to Saigon. 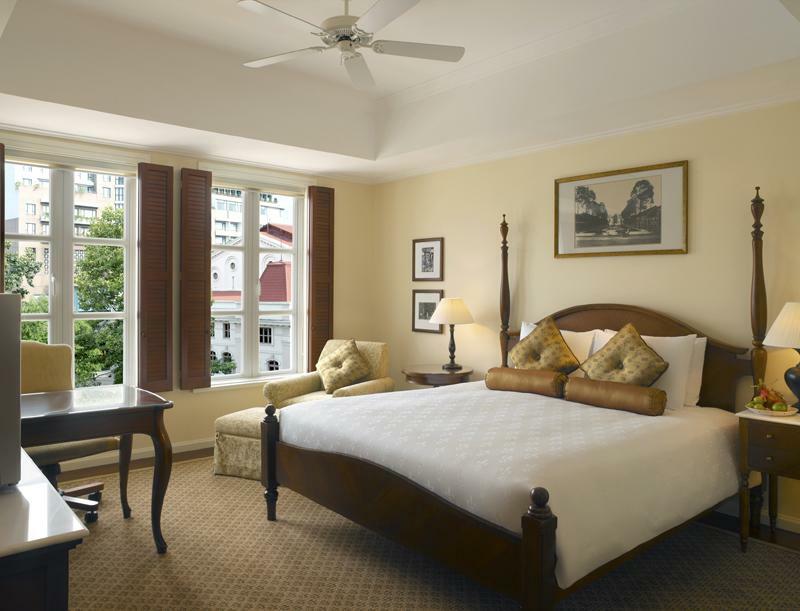 On arrival met and transferred into the city centre where you check-in to your choice of hotel for 3 nights. The rest of the day is free to get your first taste of this vibrant city. 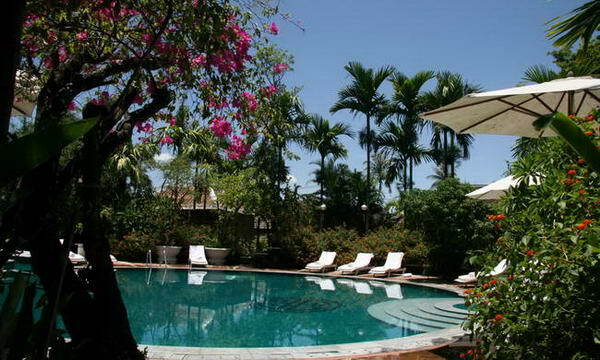 Morning free then meet in the hotel lobby for the small group (max 8 people) Saigon City tour. Saigon is Vietnam’s largest city but only dates back only 300 years. In 1859 it was captured by the French and became the capital of Cochin China. From 1956 until April 1975 it was the capital of the Republic of Vietnam. 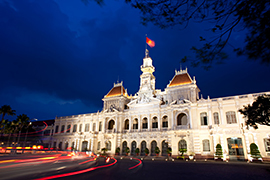 Today, Ho Chi Minh City is at the heart of Vietnamese business and entrepreneurial activity. City centre highlights include the colonial Notre Dame Cathedral, Old Post Office & Opera House, as well as the Reunification Palace and War Remnants Museum. Move out of the centre and you get a sense of how the city used to be, as you discover the ancient canals. This area is home to many Saigonese whose livelihoods still depend on the Saigon River and you’ll be surprised to see river banks lined with houses on stilts. Cruise the Saigon River by speedboat as the sun sets on this fascinating city. Arrive back at the hotel at around 6pm. During the guided tour it’s possible to descend into the layers of tunnels that although widened, still create a feeling of creeping claustrophobia. 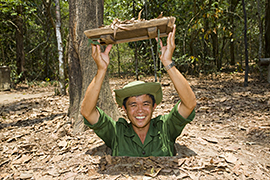 Few other places encapsulate the sheer will-power that the American military was up against and the lengths that the Viet Cong were prepared to go to in order to evict them. Back to the city for a late lunch (own expense) and the rest of the day's free.